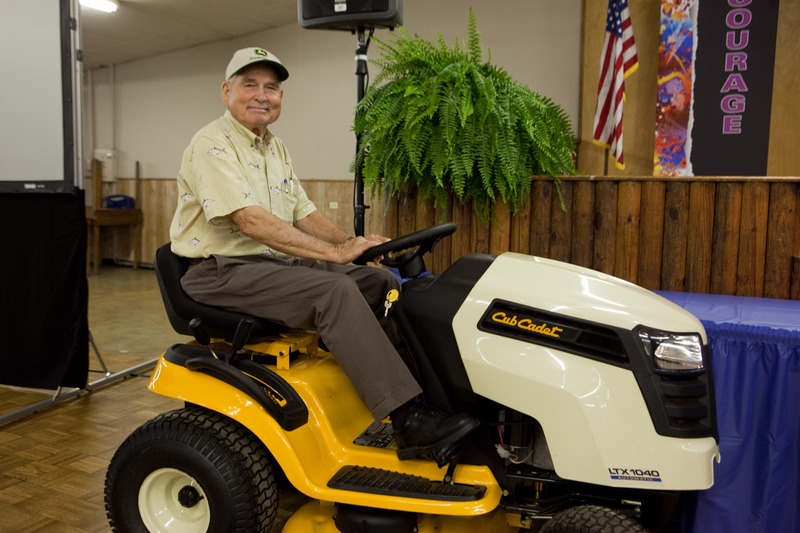 Wilbert Schneider, of Elgin, took home the grand prize at Bluebonnet’s annual meeting, a Cub Cadet riding mower. It was one of 25 door prizes that were donated by area businesses. Wilbert and Jeanette Schneider aren’t new to Bluebonnet’s annual membership meeting. But after taking a few of years off from regularly attending they’ve started a streak of sorts. Wilbert has won a door prize two years in a row. Last year he was able to carry his prize home. This year he won the grand prize – a Cub Cadet riding mower – and it had to be delivered. The Schneiders live in Elgin and have big plans for their new mower. The Schneiders needed a new mower last year, so they bought one. They haven’t decided who’ll get to use the new one. The Schneiders attend their credit union’s annual meeting and Aqua Water’s annual meeting, but haven’t had any luck winning a door prize at either meeting. Bluebonnet gave away 25 door prizes this year at its annual meeting, all of which were donated by area businesses. Sounds like she picked a winner in Wilbert. Have you ever wondered about the future of electric use? Perhaps you’re curious about how some global or national events might impact your power, the environment or your bill? Maybe you’re just interested in what’s going on at Bluebonnet Electric Cooperative. We want to share what we know, and that’s what the Bluebonnet Blog is about. Will Holford, Bluebonnet’s Manager of Public Affairs, is going to write most often for the blog. He’s been with the co-op since 2007, and has worked in communications for more than 14 years. Will enjoys learning about energy – and writing about it. He and other Bluebonnet employees (and occasional guest contributors) will get the conversation going -- about everything from where your power is generated to where it’s used, advances in technology, changes that will affect you, and interesting peeks behind the scenes at the co-op. We welcome your comments, questions and ideas. Email Will at will.holford@bluebonnet.coop.